To throw someone under the bus is a phrase meaning to sacrifice another person, who is usually not deserving of such treatment, out of malice or for personal gain. 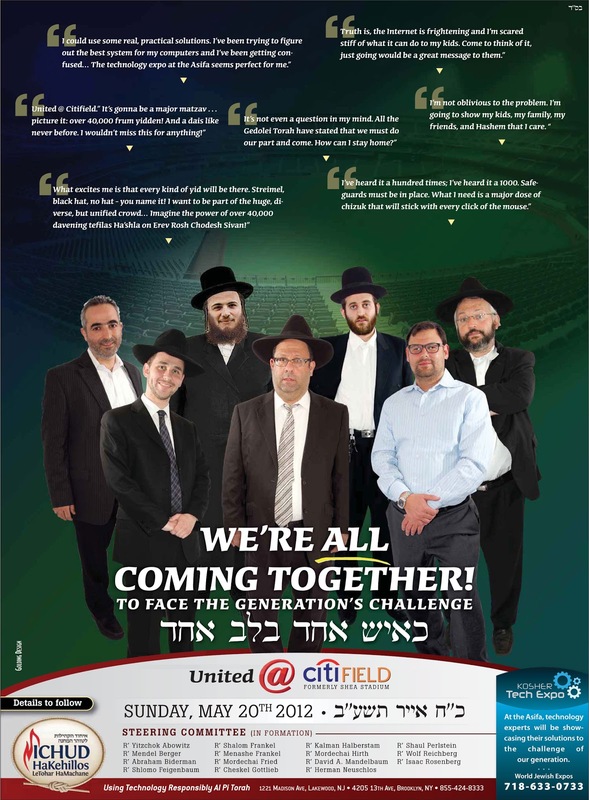 The below article was written by Rabbi Nechemiah Gottlieb: Director of Ichud HaKehillos LeTohar HaMachane, and organizer behind the Asifa Convention at Citi Field. It was published in the FJJ. It was in response to what I wrote the previous week Blaming Technology - the latest fad:. My article was written with respect and to express my views but his response was vile and mean. While I was hoping to read letters that either supported or challenged what I wrote (and there were some) I was surprised and shocked to see an opinion piece in the following week's paper accuse me of “criticizing all of gedolai yisroel as being dim-witted, out of touch and naive”. I never said anything remotely of that kind, I never mentioned any Rabbis name and I never even referenced anything a Rabbi might have said. The method of finding a gadol that agrees with your opinion and then accuse anyone that disagrees with him as “anti-gedolim” is not just Motzei Shem Ra but makes any discussion on the issue a waste of time. In addition, his false accusations were followed by a statement in the FJJ that insinuated that my letter was not in accordance with Das Torah. Random quotes from specific Gedolai Yisrael at the Aguda convention were inserted as to make it seem as I differed from them. . The entire story of what happened can be read on my other blog called OPINION-PHOBIA and the MORAL MAFIA! Rabbi Nechemiah Gottlieb was also Former director of Technology Awareness Group. The group responsible for enforcing and sometimes even blackmailing the religious communities, Yeshivos and Bais Yaakovs into signing the internet ban over the past 10 years. Rabbi Gottlieb is connected with the Vaad Hatznius in Eretz YisroelRabbi Gottlieb was also behind the "Kosher phones" sold in Israel and forcing the rabonim to sign on. I then tried to respond with this letter, but the FJJ refused to print it, here is my story. Some people asked to see what the Director of Yichud wrote about me so I posted here. Who does this guy think he is? What are his credentials? "It’s those that think their children are somehow protected from this, by not allowing them access, that are naive." Lets be very honest, Mr Teitelbaum. What would you say is the majority opinion of todays Gedolim - Like those who think like that (that not allowing access protects the kids), or do the majority of Gedolim believe that kids can be protected with allowed access. The truth now - in your mindset at the time you wrote the letter, what did you think the opinion of the gedolim was? I think the word gedolim is so vague. Every rabbi I spoke with recently had a different opinion on the matter. My Gadol is bigger than your Gadol so mine counts more! "majority opinion of todays Gedolim"
That phrase has been so overused in the past decade that it has lost much of its meaning. We've seen that with a whole bunch of causes in the past decade and this one is no different. It's getting to be a meaningless expression. If your Rov's name gets out that he opposed "the majority of the Gedolim" he gets in big trouble. So nobody wants that to happen. Instead the Rov confides that he can't be quoted as saying so. So your left not listening to "the majority of the Gedolim" and your very shtark neighbor who read the flyer and honestly just wants to listen to "the majority of the Gedolim" thinks your an oisvarf! This the sad state of affairs we are in today. Come to the asifa? Sorry, I won't be able to make it. I just noticed the picture of Rabbi Nechemiah Gottlieb. Hey I recognize him but I thought his name was Anonymous! This Gottlieb is small potatoes compared to the Messianic Lubabs and Helbrans people your father had to deal with! Hatzlacha Dovid! May Hashem be with you! Feel free to contact me and Ill add your stories to my list. I see I have to spell it out for you, so I'll try again. Lets be very honest, Mr Teitelbaum. What would you say is the opinion of the Rabbis mentioned in the Pamphlet - i.e. Rabbis Salomon, S Kamenetsky, R Feinstein, C L Epstein, E Brudny, Skulener Rebbe, Skver Rebbe, M Green, S Dishon, A M Kotler, Novominsker Rebbe, A Schechter - are they like "those who think like that" (that not allowing access protects the kids), or do these Rabbis believe that kids can be protected with allowed access. The truth now - in your mindset at the time you wrote the letter, what did you think the opinion of these Rabbis was? Exactly. It's part of the shtick. "Listen to me, I'm a lamdan and you're not." "I've got an in with all the gedolim and I'm on the right side of the tracks, you're a leitz and will burn in gehenom"
Like you, I know how this works. Everyone is a rabbi, even if he is teaching 3 year olds aleph beis. Say something wrong and then all of a sudden you are a Mister. While it very nice of Teitelbaum to decline to be called Rabbi (I wonder what his campers call him?) and godol me-rabbon shemo, even Rabbi Gottlieb is savvy enough to call him Rabbi Teitelbaum. What should he have said? Dovid? Mr. Teitelbaum is meant to convey one thing in our society: baal habos. At least in a polemical context. So you can protest that we don't know what you meant all you want. All Teitelbaum did was write his opinion which may have gone against the grain. I say may have, because I am not convinced that he does not echo the views of a sizable part of the community who do not think that suddenly we have a 614th mitzvah, to go to a baseball stadium on May 20th. The reaction he received for daring to state his views is one of hysteria and anger. Teitelbaum himself claims that he has experienced behind the scenes ugliness, and I don't know why I should assume he is lying. So I don't think that my comparison to a group of people eating alive one of their former colleagues is inapt, and I also don't think I am overstating it to raise the specter of Stalinism. You know what kind of society cannot tolerate a dissenting opinion? You know the guy on trial would get off in Beis Din Hagadol if every judge felt he was guilty. Unanimity ain't all it seems. Actually, our author has not even been subjected to a show trial yet. S.,lets put these silly 'Rabbi vs Mr' semantics on the side for now. Lets get to heart of the issue. "He is criticizing the position of all of Gedolei Yisroel and (almost) all Rabbonim and Mechanchim in Klal Yisroel." Teitelbaum responded with: "I will put in bold what I thought was blatant Motzei Shem Ra and accusations about me that were completely false." I ask you S., who do you believe is correct here. I'm not asking you if there are gedolim etc who share teitelbaum's opinion. I'm asking if teitelbaum was indeed critizing those who gotlieb refered to as gedolei yisroel etc (ie as in the many names i mentioned in my 9:12 comment), and in turn, refering to them as naive. Further, teitelbaum claims that gotliebs response was "vile and mean". No, I don't think he deserved that. A) My problem with teitelbaum is that I don't think he's being honest here. I believe that he knew he was critizing the gedolim, (Is that a problem? thats for himself to decide. I ain't his mashgiach ruchni) but he's playing naive here and accusing gotlieb of being motzi shem on him. BTW, I just want to say im reading so many email, posts and facebooking and my head is all over the place, so I may have posted things that are misdirected or read things wrong. I have to look over everything and see who is asking sincere questions and who was just hocking. I apologize that I dont have time to check over now. I will be turning off the comments until I can sort this all out and then re-post them all. I am not naive, but I honestly can't comprehend why every issue in frum society may only have one official view, and everyone else quakes in their boots to say another one and sign their name to it. Don't we both know this is true? For the person above that said " If you're gonna publicly take on the Rabbonim and make them look foolish (why are they wasting all that money for a pointless asifa etc etc),"
I dont recall ever saying that. I wrote an open letter telling them what I thought the issue klal yisroel is facing, its not filters" They could have taken my suggestion and speak about the issues I wrote. As someone who knew you father, I find your blog refreshing. I know know that with his loss all was not lost. You can thank NG for helping me find your blog. Thanks for your right up. BTW came across this post on your blog. and my stats also show a heavy traffic from lakewood, also many from filtered ISP's! So who is to stop me from posting shmutz. Also I noticed a lot of trafic from Bechadrei Chareidim site but I dont know anything about it. One thing is certain this is not a question of what came first the chicken or the egg, the rabbamin did not come to these askanim organizing the ichud, asking what can be done. These few individuals came to the rabbanim for their own purpose, for their own agenda (whether for kavod, money, or hiding their own skeletons in the closet) telling all kinds of stories, some greatly exaggerated, how bad cell phone are, how destructive internet is, and of course the rabbanim listen and agree. If they would really mean the chinuch of our children and the future of yiddishkeit, why do they get so upset with someone else’s view? What is wrong with including all ideas at such a big event? It’s the perfect opportunity to try all ideas, especially when the ideas the ichud wants to implement were already tried and it failed. How do I know that? Once rabbi gotleib came out with his letter I decided to do some research and find out who are these askanim? well to my (not so) surprise I found out that one of the askanim that you see in all pictures is the same one who tried to impose in isreal all frum shtick , kosher cell phones, kosher buses etc, he is on the vaad mishmeres tzniot (plenty dirty stories there too). Well if you will do some research you will see for yourself that a lot of mosdot in Israel adapted this policy that if you don’t have the kosher cell phones your children are dismissed from the mosdot. (Let’s not discuss the point that most Frum people in Israel have 2 phones for this very reason). Can anybody please tell me did the situation become better controlled since this went into effect several years ago? The answer is a resounding no!!!! The statistics say that in the last year about 1000 chareidi boys and girls in Jerusalem dropped out!! Now they are trying to impose it all here with kosher cell phones, kosher cameras, and one of the main things at the ichud is their very own kosher computers with internet. Yes internet is a very big problem if you don’t teach our children what is usir and what is mutir, what is wrong and what is right. Any land line phone can be used the wrong way, you teach a child not to call those deadly phone numbers. Internet is a part of life today and it is only going to become more and more. You give your child guidance in all aspect of life, get used to it, it’s a new aspect of life, give him guidance here to, how to deal with it, how to behave with it as Rabbi Teitelbaum says. Rabbi Teitelbaum, could you please offer some kind of update regarding what position the Gedolei Torah are taking? Have you asked ANYONE from the Moetzes what their position is?? I'm not a Rabbi but Im looking at the photos and I dont know any of those Rabonim, Im not chasidish. I spoke to the Rabbis of the flatbusch community and others and It did not seem like they were behind the Asifa. But I Dont really care. My letter was not about having the Asifa, it was about education. Its the people on blogs that thought the Asifa was a bad Idea. If you could give me a name of a Rabbi from brooklyn that is not a chosid, I will try to find out. Or you could and let me know. How about calling Rav Shmuel Kamenetsky or Rav Aaron Shechter or Rav Aaron Feldman or Rav Dovid Feinstein or Rav Reuven Feinstein?? All these Rabbonim are not chasidish and are part of the Moetztes- leading the Agudah. Call them, or at least one of them- it will be interesting to know if the litvish Rabbonim support this event. I have spoken to some and heard from others about their opinion on the matter. It did not seem they backed this asifa. But I wont post their opinion on my blog. I also dont know your agenda. If you call me and disclose who you are I will share with you a little of what I know. No agenda. I just want to know if this asifa is being supported and overseen by the Gedolei Torah and Manhigei Hador. For some strange reason, there does not appear to be any clearity from those who supposedly don't support the event. On the other hand those who do support the event are being very vocal in telling everyone to attend. Since you took an interest in addressing the topic, I figured you did some research as to who supports it and who doesn't, and could shed some light on the question. When one side is silent and one side is vocal- then most will listen to the vocal side. And it's hard to blame them, isn't it? First of all, I did not say any "Gedolim" have been vocal in supporting the asifa, however there have been very respected Rabbonim who have been very vocal in support. On the other hand, I have not heard of even one of the respected Rabbonim, Gedolim, or Manhigim been vocal against the asifa. I'm not interested in "rating" rabbonim. But Rav Matisyahu Salomon and the Skulener Rebbe are two very very respected Rabbonim who have not only been vocal about their support, but they have traveled to diff communites to instruct other Rabbonim to support it. Could you name two very very respected Rabbonim who have been vocal against the asifah? Rav Matisyahu Salomon and the Skulener Rebbe are the only names that come up. 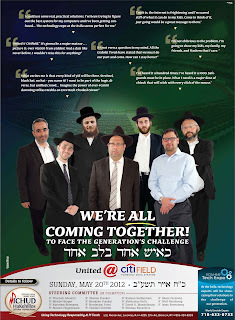 The fact that other rabonim showed up to their meeting and photos were taken does not mean they support the Asifa. From what im told the Asifa was not really discussed at the event. The fact that no one came out against is not surprising. Nobody wants to be the one to say something. But that doesn't mean they support it. Unfortunately this is the way things are today. Nobody speaks up besides the "Kanaim". They planned the event and they implemented the event. I still havent even heard Rav Matisyahu make a statement about this Event. I could be wrong about that. So, Rav Matisyahu Solomon, Rav Malkiel Kotler, and the Skulener Rebbe have publicly spoken in support of the asifah. Please name three respected Rabbonim who have spoken against the asifah. Could you list one? This is not some minor event in Brooklyn or Lakewood. This is an event attempting to draw tens of thousands of Jews from across the tri-state area, in the most public format possible. Not only will it be reported in Jewish Newspapers, how could anyone doubt that it will be in all the secular newspapers? In short this is an event that will be viewed to represent American Orthodox Jewery. Are you telling me that the Moetzes and Ziknei Gedolei/Poskei Hador are against the asifah, but will not vocally state so...and allow the klal to be represented in a way that they are against? Here is a site that shows pictures from a Monsey "asifah meeting." Notice that the pictures show Rav Breslauer of Monsey speaking in support...also Rav Efraim Wachsman in attendance. Perhaps you could list one well known Rav against the idea? Again they all spoke about the dangers. They didnt give their support for the event! Listen, I dont care either way. But im convinced very few will show up. Where did i write nobody should go? They asked me on the radio and I said i have no take on whether people should go. I just think this will go down as one of the biggest scams ever pulled on klal Yisroel. But hey Im just one guy. Why do you care so much? I just care about what the truth is. I don't have an agenda. Just your constant claim that the majority of leading Rabbonim do not support the asifah, sound a bit weak- when you can't eveb list one name...I'm not saying it's not true, I'm just saying that it would be really nice if you could support your claims with the same actual data/facts (names). Don't you think that makes sense? I dont like talking for other people. Please just answer: Do you know first hand if there is anyone on the moetzes who is against the asifah? It does say there that Rav Matisyahu spoke in support of the event. So If that article which BTW is over a month old is correct then I stand corrected. It says the others were in attendance and spoke. I didnt hear the speeches, but that doesnt mean they support this huge event. Its one thing to talk about the dangers of the Internet, its another to plan a million dollar event. If these rabonim were for this event than I am sure their names would have been on the ad. But instead it said ALL gedolim are coming. You trust an add in the paper that sounds desperate? I dont! It has nothing to do with trusting an add in a newspaper. Rav Salomon, the Skulener Rebbe, Rav Malkiel Kotler, Rav Breslauer have all spoken publicly in support of the asifah. If there are respected Rabbonim who are against the asifah who are they? Why would they allow the klal to be part of something that they are against? How could you claim that they all are against the asifah, but are afraid of the kanaoyim? The kanoyim would be powerless if there was a "kol koreh" with a long list of the most respected rabbonim stating there position is against the asifah. Why wouldn't they publicize their opinion? They went to a meeting! They never supported any Asifa!!!! Being silent doesn't mean ones agreed with it. On the recent asifa ad that you posted, there's a phone number for Ichud Hakehillos (the organization behind the asifa). Why don't you call them and ask which Rabbonim support it? Great idea. Call them and post here. Please dont post the word all! I could care less. You seem concerned so call. But Im no chosid of Dovbear. so really who cares? And the Asifa will remove these problems. How? It is being reported that R Chaim Kanievsky said that all bochrim should close their gemaras and attend the asifa. Should they fly in from Israel. I know they are giving out free tickets to all yeshivos, why not pay for their flights too? They are already spending a ton of money for an event that has yet to state a real goal. I agree with what he wrote on his page. I include myself in the second category. Just look at my profile. r gottliebs last line in his response article shows how naive he is, he writes "anyone that doesnt belive that the more sheltered you are in your youth the more yiras shomaim you will have when you are older, is missing the basis of chinuch"... if thats the case how does he explain the sheltered chasidishe youth who history has shown that statisticly most of them grow up to be the bigest perverts, so much so for the greater yiras shomayim because you were sheltered as a youth, to the contrary..
"Sheltering our children. Is that our Mesora?" Reb Shmuel Kamenetzky, Reb Avremel Ausband, Rav Meir Stern, Rav Chaim Epstein, and Rav Kalmanovitch (Mir NY) are all openly against it, and are not sending their bachurim. Reb Shmuel is completely against it. The fact that his name is superimposed on the ad means nothing. And you expected Mordy Mehlman's rag to behave any differently? I was naive at the time. Many years ago I went for a job interview at a certain PR shop near Avenue J and was treated very shabbily. I'm not in your position and definitely not on Rav Matisyahu or the Skulener Rebbe's postiton. BUT... by declaring all along I'm convinced very few will show up... and now May 30th to post that virtually ALL of heimish klal yisroel residing in the tri state area were scammed is naive, dumb, childish and sore loser to say the least. I mean the facts speak for themselves. If you feel we were all scammed after hearing your warning cries for so long, then we are dumb enough to deserve being scammed! Otherwise it's time you come to the realization that you obviously are missing something. Theree always was disenfranchised youth in klal yisroel. SOme formed groups called The Bund, Zionist Youth Organization, The Socialist Party etc. and other naive fellows who were uneducated, poor and stupid have also formed a group and are called heimish Yidden even today in 2012 when the Bund is long gone! Obviously, following the rabbonim who labor for klal yisroel (even if are wrong) does have tremendous siyata d'shmaya! And YES 60,000 people want to be on that team! I posted this comment before they went to the Chasidim and the Rebbas. ALL heimish klal yisroel did not show up. maybe 5 percent, do the math. Your own post refutes itself. You write that 60,000 cant be scammed but then you write how jews fell for The Bund, Zionist Youth Organization, The Socialist Part... Evidently you can fool people that follow the wrong leaders. You make no sense.